The first thing that a potential newsletter reader will see is the subject line. So, make sure it’s effective and concise. Using a boring email subject line like your company’s name and the word “monthly newsletter”, for example, is a no-go. You definitely won’t get a good open rate from a subject line like that. Once you get your customer to open your newsletter, make sure they have something that is aesthetically pleasing to look at. You want to leave a good first impression. So, make sure the email newsletter design is consistent with your website and your branding (and that it’s generally pleasing to look at). Go ahead and mix up the content in your email newsletters. Of course, everyone wants sales coming from emails and newsletters, and while this is completely fine, make sure you are not only focused on hard-selling. Educate your readers with useful information that can help them with their problems. 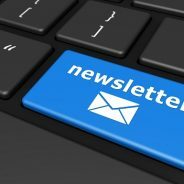 These are only a few tips to keep in mind when sending out email newsletters. Get in touch with WSI OMS for more information about email marketing, SEO and content marketing today.